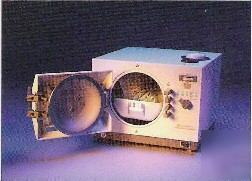 Global Autoclave Compliance is a widely recognized industry leader. Our clients include leading medical, dental and related health care practices committed to infection control and patient safety. We monitor and document autoclave sterilization effectiveness through biological spore testing. Biological spore testing is the only compliant testing method approved by the CDC, State Health Department and Autoclave Manufacturers. Our spore test monitoring program is convenient, comprehensive, and in many states… "It’s the Law". Weekly, Monthly, Bi-monthly and Quarterly contracts are available. The Biological indicators used by Global Autoclave Compliance provide the best assurance of sterilization, by challenging the sterilizer with a highly resistant spore in a quantifiably denser population . We only trust the world wide leader 3M to manufacture our Biological Indicators, bringing you unparalleled quality! The unique ampoule design provides a challenge to steam penetration similar to that which would be encountered in restricted areas of instruments. The self contained design also greatly reduces the potential for sample contamination. This more challenging test varies greatly from the old glassine envelope used by other third party labs. 1. Use mechanical, chemical, and biological monitors according to the manufacturer's instructions to ensure the effectiveness of the sterilization process (IB) (248,278,279). 2. Monitor each load with mechanical (e.g., time, temperature, and pressure) and chemical indicators (II) (243,248). 3. Place a chemical indicator on the inside of each package. If the internal indicator is not visible from the outside, also place an exterior chemical indicator on the package (II) (243,254,257). 4. Place items/packages correctly and loosely into the sterilizer so as not to impede penetration of the sterilant (IB) (243). 5. Do not use instrument packs if mechanical or chemical indicators indicate inadequate processing (IB) (243,247,248). 6. Monitor sterilizers at least weekly by using a biological indicator with a matching control (i.e., biological indicator and control from same lot number) (IB) (2,9,243,247,278,279). 7. Use a biological indicator for every sterilizer load that contains an implantable device. Verify results before using the implantable device, whenever possible (IB) (243,248). Monitor sterilizers at least weekly with biological (spore) indicators.1 Check whether your state dental board has different requirements. Consider using biological (spore) indicators daily if the sterilizer is used frequently (e.g., several loads per day). Daily monitoring allows for earlier discovery of equipment malfunctions or procedural errors. A positive spore test result indicates that sterilization was incomplete. Maintain a log of spore test results. Check your state regulations to determine how long you need to keep spore testing records. 9. Sterilization Monitoring: The use and functioning of heat sterilizers should be biologically monitored at least weekly, or more often if the practice demands it, with appropriate spore tests. Place the spore strips or vials inside a pouch, bag, pack or cassette, and include this package as part of the normal load through a normal sterilizer cycle. Always use a control spore strip or vial (not heat processed but otherwise treated identically to the test strips or vials) with each spore test performed. Additionally, chemical indicators should be used on the inside of each package during every sterilizer load. Accurate records of sterilization monitoring must be maintained. A chemical indicator from inside each pack may be initialed and dated for each day of patient care and kept in a file. The weekly spore test for each heat sterilization unit may be kept in the same file. Biologically monitor whenever there is a change in packaging, following equipment repair; retest after failure and when training new employees. AAMI: Steam Sterilization and Sterility Assurance, 7.5.4 Test Frequency. "Biological indicators must be used no less than weekly for each sterilizer and, preferably, should be used for each load. More frequent testing should be carried out on an as needed basis (I.E., after major sterilizer repairs, when evaluating sterilization of new products, when implantable or intravascular materials are sterilized, etc.)". Recommended Practices, Sterilization & Disinfection, 1987. "For routine monitoring should be used weekly, and as needed; each load of implantables." VA Manual G1, MP-2, 1985 and MP-2, Sub-chapter E, Change 159, June 22, 1983. "Must be monitored no less than weekly, each load of implantables or intravascular materials, following major sterilizer repairs, new products or packaging material." 1 BIOLOGICAL SPORE TEST KIT WITH EVERY AUTOCLAVE SOLD!